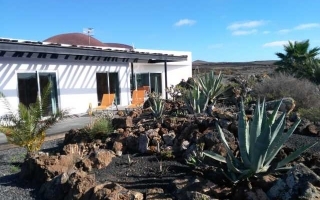 The villa is distributed on one floor, recently renovated and decorated, spacious living room with large windows which allow you to appreciate the wonderful views, a modern and functional kitchen, 3 beautiful bedrooms, one is a suite, and it has another bathroom with shower. All rooms are excellently lit and, since they are surrounded by the entire outer surface of the housing, giving it privacy and intimacy like no other. Besides, this beautiful villa offers magnificent outdoor areas that make up a total area of ​​350 m², which are heated pool, garden areas and local flora, barbecue, outside table under a pergola to enjoy any time of day or night, and a relaxation area to enjoy the tranquility of the island.